All new in 2014, Mazda 3 is in its third generation and with nearly four million vehicles sold worldwide continues to be the brand’s best-selling vehicle in North America and globally. Year to date, Mazda 3 has captured 54 percent of Mazda’s passenger car sales in the U.S. and more than 33 percent of the brand’s total vehicle sales1. The 2015 Mazda3 began hitting showrooms in August and, although a carryover model year, includes an array of new standard features and package content. Since entering the market as a redesigned vehicle last year, Mazda 3 has not only hit its targets but also exceeded them. Similar to its new-generation SKYACTIV®2 TECHNOLOGY and KODO “Soul of Motion”-designed brethren such as the CX-5 compact SUV and Mazda 6 mid-size sedan, Mazda’s compact car has earned itself critical acclaim by topping “Best Car” lists and receiving “Car of the Year” nods. 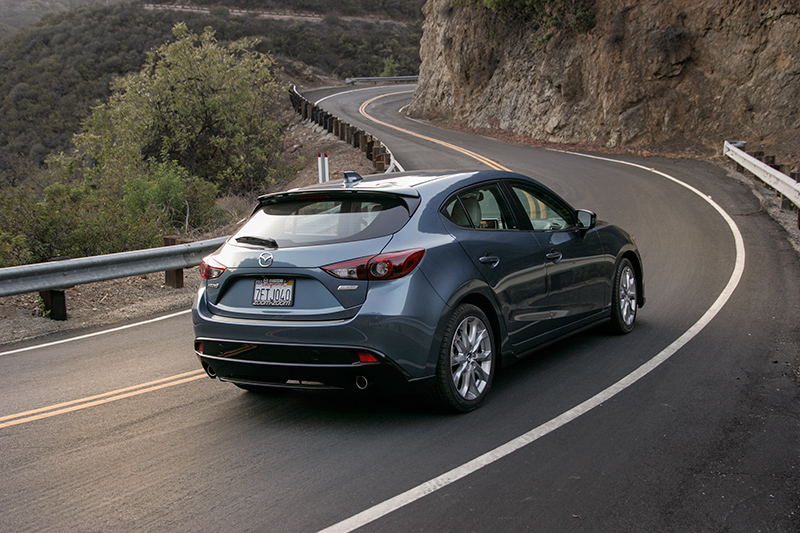 For 2015, Mazda 3 remains poised, looking to maintain its head-of-class status while continuing to pursue new objectives. Low and lean, the 2015 Mazda 3 sits on a 106.3-inch wheelbase with four-doors measuring at 180.3 inches in length and five-doors curtailing 4.7 inches to 175.6. With vehicle height at 57.3 inches and its width at 70.7 inches, Mazda 3 offers an ample 38.6 inches of front-row headroom (without moonroof) and 37.6 inches in the rear. Front and rear legroom are measured at 42.2 and 35.8 inches, respectively. And what do these measurements mean? Nothing, if presentation is wasted. Thankfully Mazda has a knack for doing more with less and creating opportunities not apparent at first. KODO design is an example of this resilience. Taking visual and emotional cues from the environment, particularly the movements of wildlife that thrive within its savannahs, jungles and forests, Mazda designers sought to capture this build-up of power and fluidity of motion. Every sculpted angle and sinewy form was crafted to breathe life into a supposedly inanimate object. But the philosophy is that vehicles are alive, communicating an instinctive bond between itself and the driver behind the wheel. If the heart beats with exhilaration whenever the roar of an engine comes to life, why can’t a design produce the same excitement? 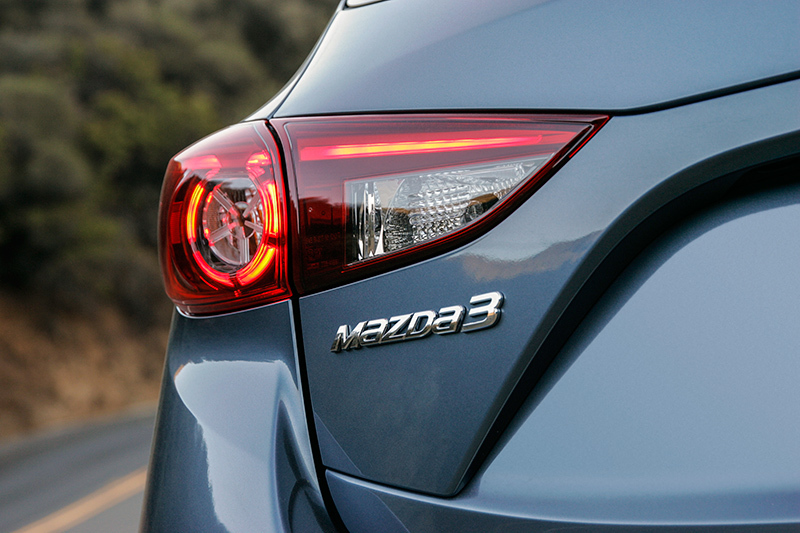 At all times, from every angle, Mazda 3 is stunning. Compact cars often times are derided with the “my first (cheap) car” stigma but vehicles of any segment at any price should always strive to look amazing. By being named a top three finalist for this year’s World Car Design of the Year is further proof of Mazda 3 tossing out the stereotype that affordable vehicles cannot offer rich designs, especially when the co-finalists were long-lauded German luxury brands. The 2015 Mazda 3 offers sophisticated artistry, from the vehicle’s cab rearward posture and highly raked profile to its five-point “signature wing” chrome-accented grille and flexing rear fenders. And every stroke was made with purpose, to capture reflections and invoke dramatic depth in the paint. Not surprisingly, the design team’s efforts carried a dual responsibility: fuel economy. Mazda 3’s chiseled looks achieve a coefficient of drag (Cd) at 0.255 for sedans and 0.275 for five- door models, if equipped with the pairing of active grille shutters and i-ELOOP, the world’s first capacitor-based regenerative engine braking system to power all of a vehicle’s electrical components. Mounted in front of the radiator, the active grille shutters automatically open and close in accordance with driving conditions to improve aerodynamic performance while contributing to real-world fuel efficiency gains. Four-door models without i-ELOOP still have a sleek Cd of 0.26 while five-door versions are rated at 0.28 Cd. Derived from “Intelligent Energy Loop,” i-ELOOP is a capacitor-based regenerative engine braking system that converts a vehicle’s kinetic energy into electricity as the car decelerates. More simply, energy is being captured the moment the accelerator is released – regardless of whether the vehicle slows down due to the brake pedal being employed or is merely coasting. This electricity is captured and then stored for later use as a means to power all of the vehicle’s electrical components, such as headlights, climate control and audio systems, which reduces the need for the engine to burn extra fuel in order to generate electricity and, therefore, improves fuel economy without sacrificing driving performance. While the increased engine braking caused by the hard-charging alternator is too small for drivers to feel, the smooth power delivery coming from the capacitor means the electrical systems do not operate differently when i-ELOOP is in use. As always, exact fuel savings will vary based on electrical loads and individual driving habits. Mazda3’s driver-oriented cockpit is every bit as expressive and purposeful as its KODO-full exterior. For example, the brake-and-pedal assembly has been laid out symmetrically to the left and right of the driver’s center line for added reactionary precision and winding road comfort. A hinged organ- type accelerator pedal also is standard equipment, which minimizes the natural fatigue associated with frequent pedal pressure, such as during a slow-and-go rush hour commute. Even the arrangement of switches and knobs, and the precise location of the shifter and multi-information commander control, are for accessibility as much as for allure. As the first Mazda in North America to feature SKYACTIV components, Mazda 3 also is the first to feature an Active Driving Display. A premium item usually found on luxury models or in larger- segment vehicles, this clear pop-up panel is vertically mounted behind the meter hood to deliver vehicle speed, navigational directions and other related driving information safely within the driver’s line of sight. To further minimize visual fatigue and keep the driver’s eyes in line with the road, the placement, or “height,” of the display information can be manually adjusted to appear where a driver would naturally be looking straight ahead. The Active Driving Display automatically folds back into a hidden position when the vehicle is shut off. Another example is the shape of the front seats. Compared to the previous generation, the seatback material selection and design equated to reduced width and thickness leading to more knee room for second-row passengers. Additionally, the driver’s seat cushion was increased and the seatback reshaped to create a more optimized and natural seating position, which also helps reduce fatigue during extended drives. Mazda 3 saw the introduction of another game-changing, Mazda-developed technology known as MAZDA CONNECT™. A next-generation in-vehicle connectivity system, MAZDA CONNECT’s seven-inch full-color touchscreen hub will make its way into the rest of the brand’s full lineup. Based on the heads-up cockpit concept, this new Human Machine Interface (HMI) system aims to aid drivers in maintaining a proper driving posture, keep a concentrated focus on the road ahead and promoting safer habits while behind the wheel. In a world where information is available 24/7 – sometime relentlessly – having access to news, social media and sports scores has never been easier. But when put into the context of driving, a constant feed of information is a dangerous distraction. Therefore, MAZDA CONNECT handles the dissemination of data for you. Driving-specific information is laid out directly in front of the driver via the meter cluster, steering wheel controls and the optional Active Driving Display in order to keep eyes on the road and hands on the steering wheel. Everything else is relegated to outside of this cockpit. MAZDA CONNECT accesses smartphone apps and connected features via Bluetooth and can easily be updated to ensure users always have the latest services without the need to swap out hardware. Music is available via standard choices such as AM/FM radio, and USB/auxiliary jack connectivity but also via premium services such as, HD Radio™ Technology, available SiriusXM® Satellite Radio and web-based apps such as Pandora®, Aha by HARMAN™ and Stitcher™. Twitter and Facebook updates also can be read by the system with audio responses available using the Shout function. However, users cannot post to their social media accounts using MAZDA CONNECT, which is programmed to only read messages already in their feed. Additionally, the system also allows users to search the internet for business information, map directions and hear Yelp reviews through the Aha Radio app. An SD card-based navigation system is standard equipment on i GT, s Touring and s Grand Touring models, a package feature on the i Touring, or as a dealer-installed add-on on i Sport and i Touring trim levels. Message Service (SMS) messages on the touch screen monitor. The system can then articulate the messages as well as allow occupants to send replies using pre-determined fixed phrases. There also is a “Do Not Disturb” function, which will silence all pop-up message notifications until the option setting is changed. The 2015 Mazda3 is available with two gasoline engine choices in the U.S.: a SKYACTIV-G 2.0-liter and SKYACTIV-G 2.5-liter. Both advanced direct injection engines feature a high-tumble 4-2-1 exhaust system which increases engine output. The SKYACTIV-G 2.0-liter produces 155 horsepower at 6,000 rpm and 150 lb-ft of torque at 4,000 rpm. The larger SKYACTIV-G 2.5-liter produces a peak of 184 horsepower at 5,700 rpm and 185 lb-ft of torque at 3,250 rpm. Two transmission choices are available with a choice of the SKYACTIV-MT six-speed manual and SKYACTIV-Drive six-speed automatic. Previously only available on SKYACTIV-G 2.0L-equipped vehicles, new-for-2015 the manual transmission can now be paired with the more powerful SKYACTIV-G 2.5L. The SKYACTIV-MT manual offers the short, crisp shift pattern reminiscent of the iconic MX-5 Miata while the SKYACTIV-Drive automatic achieves a direct shift feel and quick gear changes, which contribute to quick acceleration while maximizing the best features of a direct- shift gearbox and a conventional torque-converter system. Naturally tuned for stability, tire grip and ride comfort, the Mazda3 also features a mechatronic column-type electric power assist steering system that is compact, lightweight and has an impressively high gearing ratio of 14.0:1. 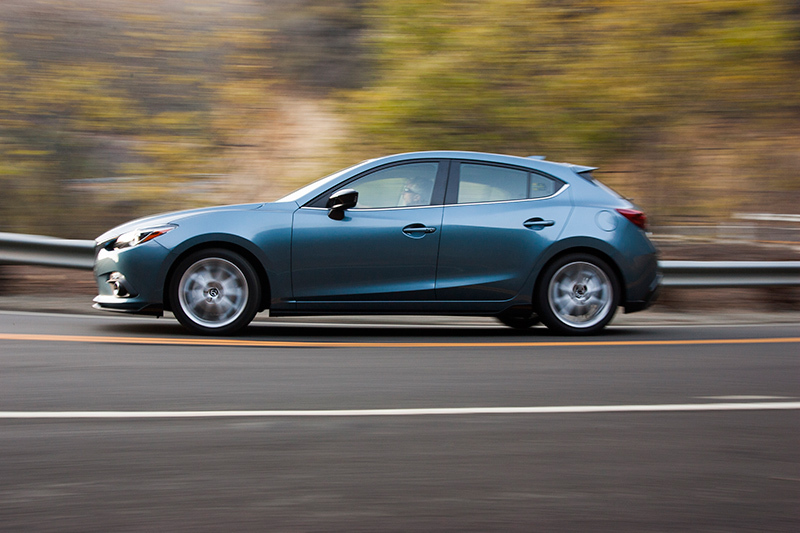 Add responsive braking and balanced roll resistance, the Mazda 3 is as efficient as it is exciting. Four-door models equipped with the SKYACTIV-G 2.0L and mated to a six-speed manual receive an EPA-estimated fuel economy rating of 29 city/41 highway/33 combined mpg. Downsizing from three pedals to two slightly improves the EPA estimated miles-per-gallon to 30 city/41 highway/34 combined mpg. Heavier five-door models still offer comparable mpg figures, which further attests to SKYACTIV TECHNOLOGY’s goal of offering efficiency to all, regardless of vehicle model and features choices. When equipped with the SKYACTIV-MT manual, the Mazda 3 five-door’s EPA- estimate fuel rating is 29 city/40 highway/33 combined mpg and 30 city/40 highway/33 combined when paired with the SKYACTIV-Drive automatic. The more robust SKYACTIV-G 2.5L also is a gas miser when compared to comparable segment rivals. Sedans equipped with the SKYACTIV-MT transmission receive an EPA-estimate rating of 25 city/37 highway/29 combined mpg while an automatic transmission pairing rated at 28 city/39 highway/32 combined mpg. Five-door models that receive a manual transmission are EPA- estimated rating of 26 city/35 highway/29 combined mpg. 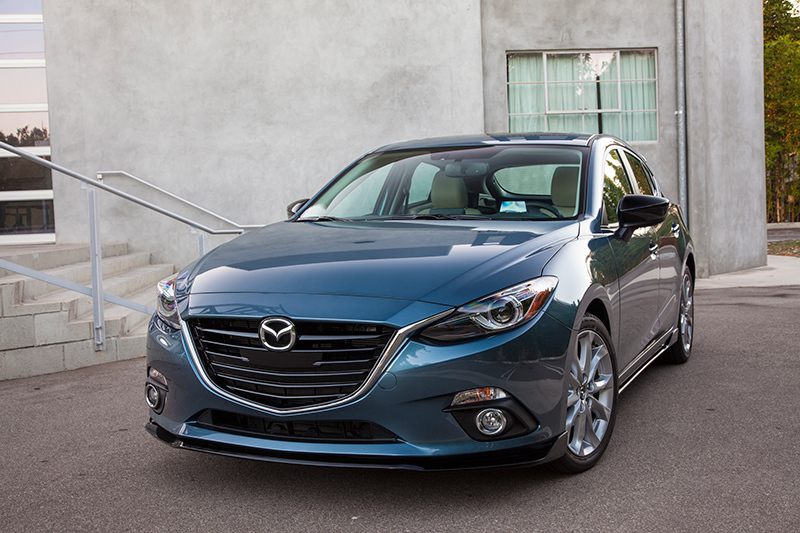 Its SKYACTIV-Drive-equipped sibling is EPA rated at 27 city/37 highway/31 combined mpg. Only vehicles equipped with the 2.5L engine and an automatic transmission can receive the optional i-ELOOP system, which is available as part of package. i-ELOOP-equipped four-door models offer EPA-estimated 29 city/40 highway/33 combined mpg while it’s five-door stable mate is rated at 28 city/39 highway/32 combined mpg. Although a carryover year, the 2015 Mazda 3 lineup receives a fair amount of added features, focusing on bringing more technology to entry-level models and fun-specific choices to upper level ones. Offered in SV, Sport, Touring and Grand Touring trims, each level is preceded by an i or an s, which signifies engine size. Except for the sedan-only i SV, all 2015 Mazda 3 models can be paired with any combination of engine, transmission and body style. Trim-specific features and options remain the same regardless of body configuration. Hardly a base model, the 2015 Mazda 3 i SV offers a multitude of standard features usually reserved for “premium” offerings by its competitors, such as push-button start, automatic power doors, a remote keyless entry system, daytime running lights and USB/auxiliary jack connection ports. Other standard i SV amenities are a matte-finish front grille, 16-inch full-cover steel wheels, body- color door handles and bumpers, dual-power folding outside mirrors, power windows with driver-side one-touch up/down feature, a tilt-and-telescopic adjustable steering column, air conditioning with pollen filter, trim-specific cloth sport seats, a fold-down rear seat, a four-speaker AM/FM audio system. Moving up to the i Sport model, MAZDA CONNECT is a 2015 standard addition and joins illuminated steering wheel controls, a 60/40-split fold-flat rear seat, Bluetooth hands-free phone and audio connectivity, a six-speaker sound system, cruise control, a trip computer, map lights, body-color side mirrors and a tachometer. A rearview camera, halogen fog lights and MAZDA CONNECT are 2015 updates for i Touring vehicles, which already features Blind Spot Monitoring (BSM), Rear Cross Traffic Alert (RCTA), 16- inch aluminum alloy wheels, heated body-color folding outside mirrors with turn signal indicators, bright beltline trim, a rear seat folding armrest with cup holders, Mazda Advanced Keyless Entry, trim-specific sport cloth seats as well as a leather-wrapped brake handle, shift knob and three-spoke steering wheel with contrast stitching as standard. A body-color rear deck lip spoiler also is standard on i Touring four-doors while a rear roof spoiler is fitted onto all five-door models. An i Touring Technology Package is available and adds dual-zone automatic climate control, an overhead console with sunglasses holder, illuminated vanity mirrors, a shark fin antenna, a Bose® Centerpoint® 2 nine-speaker Surround Sound System with AudioPilot® 2 and SiriusXM Satellite Radio with a four-month complimentary subscription. A power moonroof also is now part of the package for 2015. The i Grand Touring receives all the features of an i Touring and Technology Package combination as standard equipment as well as a six-way power-adjustable driver’s seat with manual lumbar adjustment, variable heated front seats along with leatherette seats and door panel inserts, and navigation system. There are no additional package options available for the i Grand Touring model. For those opting for the larger output SKYACTIV-G 2.5-liter for their Mazda 3, only Touring and Grand Touring trims are available. This is due to the substantial amount of standard features afforded to the more powerful and more upscale of the Mazda 3 configurations. And, for the 2015 model, the SKYACTIV-MT six-speed manual can join the premium party. 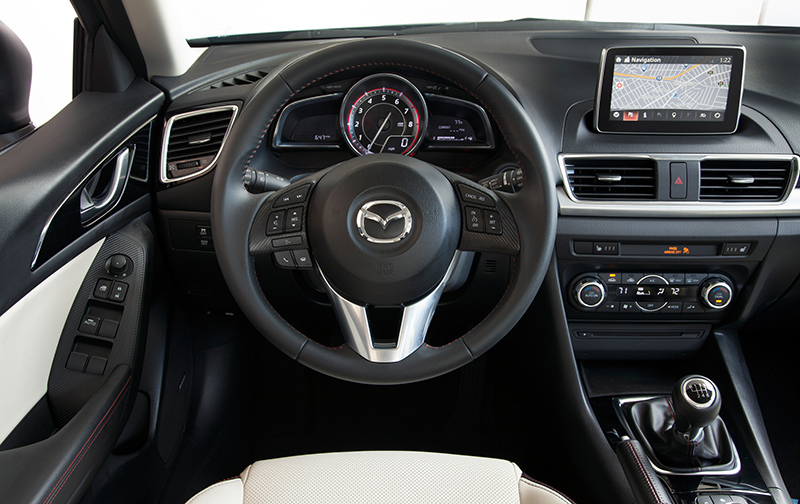 The 2015 Mazda 3 s Touring sits on 18-inch aluminum alloy wheels and its standard amenities list includes a piano black-finish front grille, an Active Driving Display, steering wheel-mounted paddle shifters (AT-only of course), a six-way power-adjustable driver’s seat with manual lumber adjustments, leatherette seats and door panel inserts, variable heated front seats as well as all the options available on the i Touring Technology Package. The 2015 model year also adds a power moonroof with a one-touch open function as standard equipment. The s Touring model itself is not available with any additional package options. A Sport mode button also is standard (AT-only of course) and offers a more direct response in terms of accelerator feel and a heightened sense of linearity. All Mazda 3 vehicles equipped with a SKYACTIV-Drive automatic transmission feature a manual shift option but the Sport mode feature on 2.5L models adjusts the shift mapping – and to a lesser extent the throttle response – to better match more engaging driving conditions, such as winding roads. The transmission will hold gears longer and not upshift or downshift as often while one is manually shifting during turns. The s Grand Touring adds to the standard features of the s Touring model with auto on/off headlights, bi-xenon headlights with auto leveling, a pivoting Adaptive Front-lighting System (AFS), LED combination taillights, LED daytime running lights, rain-sensing windshield wipers, an auto- dimming rearview mirror with a new-for-2015 Homelink® integration, perforated leather-trimmed seats. The optional Technology Package for the s Grand Touring includes the i-ELOOP regenerative engine braking system, active grille shutters, High Beam Control (HBC), Lane Departure Warning System (LDWS), Mazda Radar Cruise Control (MRCC), Forward Obstruction Warning (FOW) and Smart City Brake Support (SCBS), a pre-crash avoidance safety feature. All 2015 Mazda3 trims are available in eight colors: Blue Reflex, Deep Crystal Blue, Jet Black, Liquid Silver, Meteor Gray, Snowflake White Pearl, Soul Red and Titanium Flash. Both Snowflake White Pearl and Soul Red are premium-priced paint finishes with the latter involved a three-coast paint process to create its vivid and deep color. For interior decorating, cloth seats are available in Black or Sand while genuine leather seats are available in Black or Almond. Although this allows for a staggering number of color combinations, Liquid Silver cannot be matched with a Sand or Almond seat materials. Leatherette seats (i Grand Touring, s Touring models) are only available in Black. The 2015 Mazda 3 features i-ACTIVSENSE, an umbrella term encompassing the full suite of Mazda’s advanced safety technologies which use sensing devices such as milliwave radars and cameras to support the driver in recognizing hazards, avoiding collisions and minimizing damage should accidents occur. While these systems will not eliminate accidents, their intent is to minimize then and help reduce the severity of a crash. The focus of SKYACTIV TECHNOLOGY is not only on lightweight materials, fuel economy and driving dynamics. The combination of the SKYACTIV-Body and SKYACTIV-Chassis enhances the Jinba-Ittai spirit of offering high efficiency, lightweight materials for added strength and performance. The 2015 Mazda 3 is an exemplary example of vehicle dynamics, fuel efficiency and leading safety technology, and has received a 5-Star Safety Rating from the National Highway Traffic Safety Administration (NHTSA) as well as a 2014 “Top Safety Pick+” designation from the Insurance Institute of Highway Safety (IIHS) for both sedan and hatchback models. All 2015 Mazda 3 models are equipped with standard safety features such as six airbags (advanced dual front, front seat-mounted and full-length side curtain), whiplash-reducing front headrests, height-adjustable headrests for all seating positions, power-assisted ventilated front brakes and solid rear disc brakes, an Anti-lock Brake System (ABS), Electronic Brakeforce Distribution (EBD) with Brake Assist, daytime running lights, Dynamic Stability Control (DSC) with a Traction Control System (TCS), Hill Launch Assist (HLA), a collapsible steering wheel (following airbag deployment), a trunk entrapment release system, a tire pressure monitoring system (TPMS), three-point safety belts for all seating positions, front seatbelt pretensioners with force limiters as well as Lower Anchors and Tethers for Children (LATCH). i Touring and above models feature BSM, RCTA and a rearview camera as standard safety. The Adaptive Front-lighting System (AFS) and rain-sensing windshield wipers are standard on the s Grand Touring. (SCBS) are available as part of the s Grand Touring Technology Package. Lastly, all Mazda vehicles come with the Mazda Certified Roadside Assistance Program. Using either the toll-free number or free Mazda Assist app for iOS- and Android-operated mobile devices, owners and their family members can contact roadside assistance 24 hours a day, 365 days a year throughout the United States and Canada. In addition, the New Vehicle Limited Warranty includes a comprehensive three-year/36,000-mile warranty, which covers every part of the vehicle (except those subject to normal wear), a five-year/60,000-mile powertrain warranty and a five-year/unlimited- mileage corrosion warranty.